Enjoy some of your favorite dishes at this delicious international buffet prepared by a very special cook, Chef Mickey. Sample a wide selection of tasty specialties from around the world for both breakfast and dinner. Choose from a rotating menagerie of Chinese barbecue, Cantonese courses, Indian curry pots, European baked goods, Western grill favorites, American classics, Italian pizza sizzling hot from a wood-fired oven, irresistible desserts and much more. Food aficionados will love the open show kitchen layout, where you can see Chef Mickey’s culinary helpers work their magic as they prepare a wide variety of scrumptious dishes. With its high ceilings and shining polished-chrome columns, Chef Mickey recalls the lavish Art Deco-styled studio commissaries of Hollywood's Golden Age. Look out for Hidden Mickey decorations and whimsical murals depicting sketches of some of your favorite Disney characters. Halal menu is available upon request. Please ask your server for assistance. Say hello to the most famous celebrity chef of them all! Mickey Mouse is happy to step away from his busy duties in the kitchen to personally welcome you to his restaurant. Remember to bring your camera; you’re going to want to snap a picture to capture this memory forever. 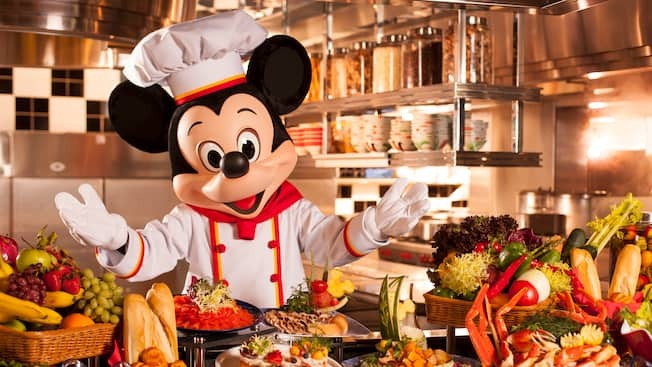 Chef Mickey will be available to meeting you every day during breakfast hours, on Sundays and public holidays during lunch hours, and on Saturdays, Sundays, public holidays and eves of public holidays during dinner hours. Plus, if you join us for Character Dining at lunch or dinner, Mickey may give kids a complimentary signed chef hat! Minnie Mouse is making her first appearance at Chef Mickey during the dinner buffet every Friday (except for public holidays and eves of public holidays). Minnie can't wait to meet you all! For questions or to make reservations, please call +852 3510-5000. Advance reservations are strongly recommended and can be made up to 42 days prior to your visit—or 120 days prior to your arrival date if you are staying at Disney’s Hollywood Hotel.